Bell’s has changed the way their cafe is operated. Please check out the most recent blog post. 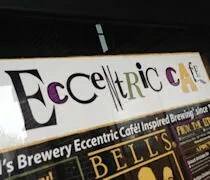 When J and I first moved to Kalamazoo in 2009, one of the first restaurants we went to was Bell’s Eccentric Cafe. At that time, I really hadn’t gotten in to craft beer yet. 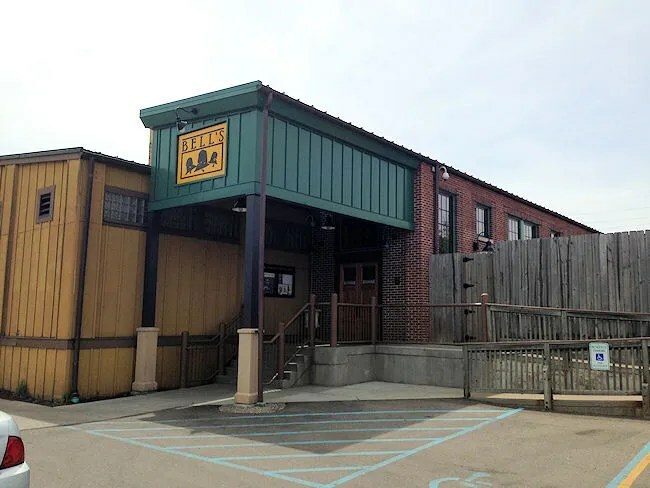 We loved brewpub’s for the food and while we liked Bell’s, we weren’t blown away by the food. Since that time, Bell’s has drastically redesigned the Eccentric Cafe and upgraded the menu quite a bit. With a little one, we don’t have a lot of time to just hang out and drink like we did in the pre-baby days. We’ve been saying for months we need to go back to Bell’s. 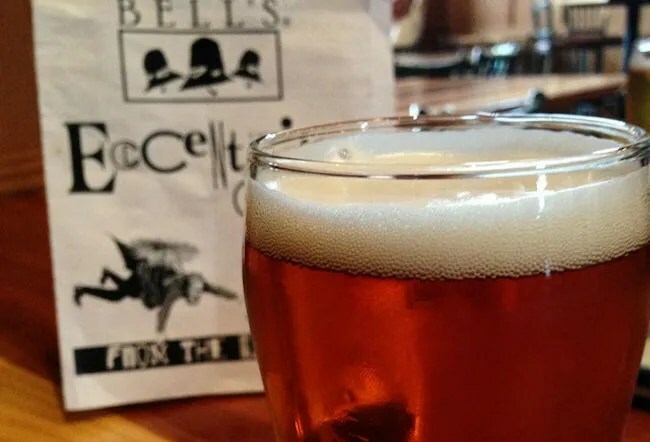 Bell’s Eccentric Cafe is on Kalamazoo Avenue behind the General Store at the site of the original Bell’s Brewery. The small parking lot and entrance to the cafe is actually on Porter Street. The redesigned cafe actually gives you a choice when you walk in the door. To the right is a great outdoor patio area. To the left is the original part of the Cafe with a slight redesign. On our first trip to Bell’s, we were really confused about how to order. It took a good ten minutes before we figured out there was no table service. That hasn’t changed, but now, you walk right by the kitchen on your way in whereas before, you wouldn’t have passed it. One of the reasons we haven’t been back in so long is because of the fact we have a one year old. They have a kids menu, but a baby in a bar is always a crap shoot. Sometimes she’s really good and you don’t know she’s there. Other times, the whole place knows she’s there. On the way in, J noticed a high chair so she grabbed one and headed to a table. I saw the menus hanging next to the kitchen window, so I grabbed a couple and joined her. The beer menu is written on a chalk board above the bar. They have all the usual Bell’s suspects as well as some small batch beers only available in the cafe and some experimental small batches. Ordering for both the food and drink is done at the bar. J grabbed a menu and headed that way. We both ordered a beer, but they do have Coke products and Izze soda if alcohol isn’t for you. J ordered an Oberon but I wanted to try stuff I can’t get anywhere else. My selection was Larry’s Latest Double IPA Trial. We both ordered 12 oz. glasses. The beer I ordered was pretty great. It wasn’t an overly bitter DIPA, but it did have a a citrus-y finish. As much as I love Two Hearted, I think I would drink a lot of this if it ever gets put in to production. J and I both sort of focused in on the same part of the menu when it came to food. I don’t remember them having BBQ the last couple times we ate at Bell’s, but the BBQ is worth the trip alone. I ordered the Smoked Meat Trio. 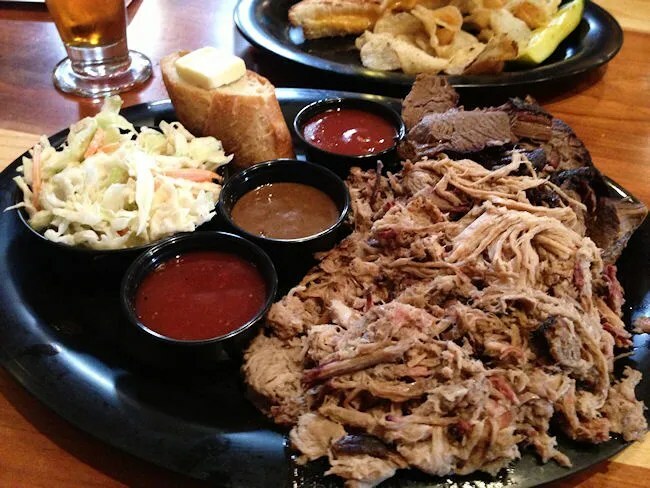 The plate is supposed to have smoked Pulled Pork, Brisket, and Chicken. Unfortunately, they didn’t have any of the chicken, so they gave me double pulled pork. Not complaining about that. The large plate of meat was full of smokey goodness. There were three cups of BBQ sauce which I didn’t really need. They were all delicious. There was a house BBQ sauce, a tangy sauce made with Bell’s Porter, and a Balsamic Mustard sauce which was very delicious. The meat was incredibly tender and juicy with that great smoke taste that lingers in your nose. The whole plate, while a little expensive, is worth every penny. I would have liked to have tried the chicken, but the pulled pork was so right up my alley I didn’t even notice. Even the brisket, which I’m not always a fan of, was tender and delicious. The rest of my plate came with a side of coleslaw and a piece of french bread. J couldn’t help but order the pulled pork. 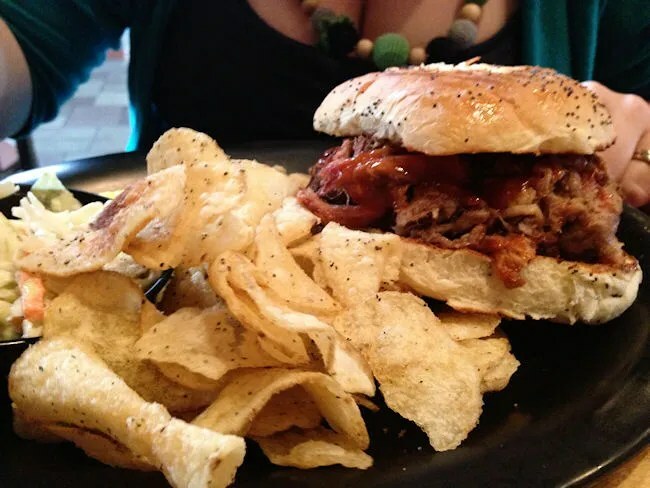 Her sandwich was served on an onion bun and it was piled high with the house smoked pork and the house BBQ. She loved the BBQ as much as I did. She said the bun was pretty incredible. It was hearty enough to hold the juicy pork, but it was flaky and fell apart in her mouth once she took a bite. The sandwich came with salt and pepper kettle chips. While we’ve always been hesitant to take L to Bell’s, we really shouldn’t have been. They do have a kids menu and high chairs. They call themselves family friendly before 8:00. After that, you do need to be 21. 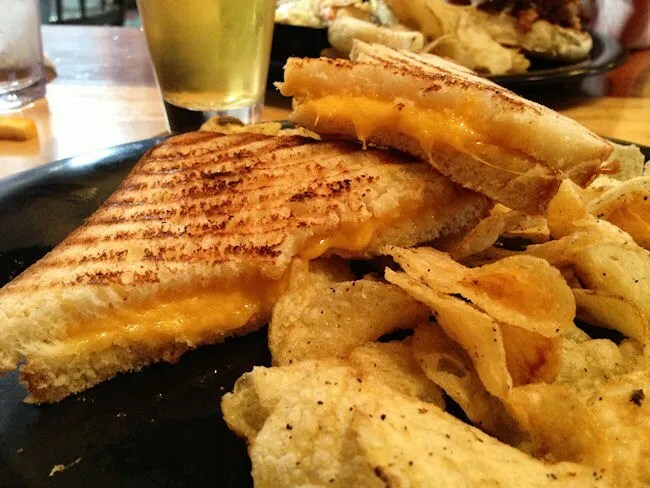 We probably could have just fed L off our plates, but we decided to order her a grilled cheese. Good call. She devoured it. The whole sandwich. That was in addition to a little bit of brisket and a handful of pulled pork. J actually picked up one piece of L’s sandwich and took a little bit and said it was very yummy. Before leaving, I asked if I could grab one more beer. 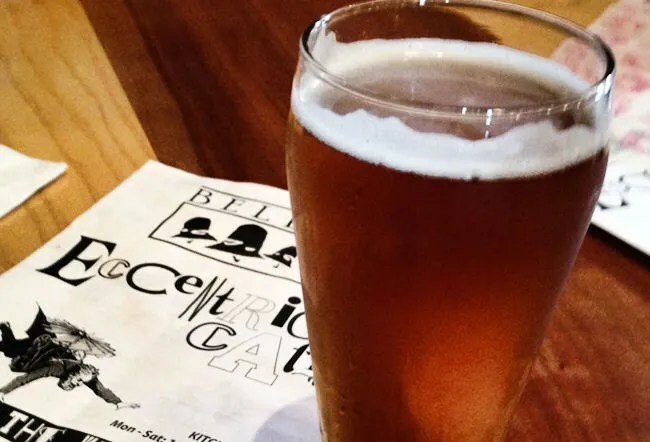 They have a whole list of beers only available in the Eccentric Cafe, but one more was going to be my limit. I ordered the Kalamazoo IPA. Pretty solid IPA, but nothing outstanding. It’s a pretty refreshing IPA with a hint of citrus. Very delicious and a perfect cap to our meal. The first time we went to Bell’s, I feel like I may have been a little hard on them. I always like Brew Pubs that excel at the food side of things too. The first couple times we went to Bell’s I wasn’t all that in to craft beer, so we were going primarily for food. At that point, the food was just alright. 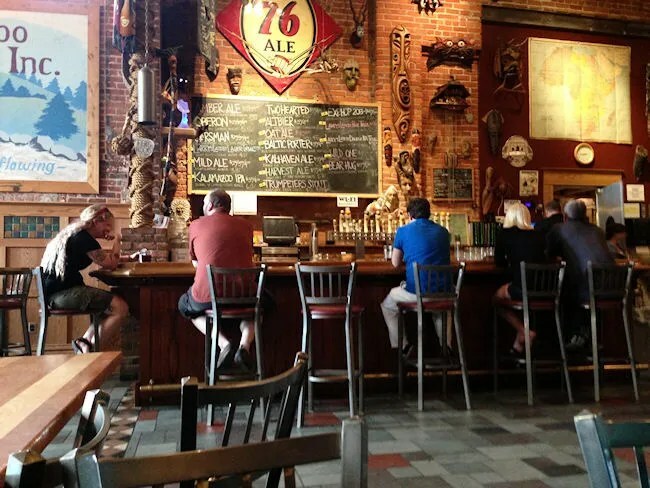 I liked it, I liked that atmosphere, and I liked that this mecca of brewing was in my new hometown. Things have changed a lot since we moved here in 2009. I love craft beer now. I love Bell’s. I can’t wait to get my hands on new bottles when they come out. For us, a trip to Bell’s doesn’t focus around the food anymore…but it could. We’re already planning a return trip next week when J’s mom comes to town. I’ve said this many times before, but Kalamazoo is so lucky to have such a great brewery downtown.